ABOARD THE EURODAM – On our previous cruise aboard the Eurodam we had the pleasure of sampling two of the ship’s special additional-cost restaurants, the Canaletto and the Tamarind. 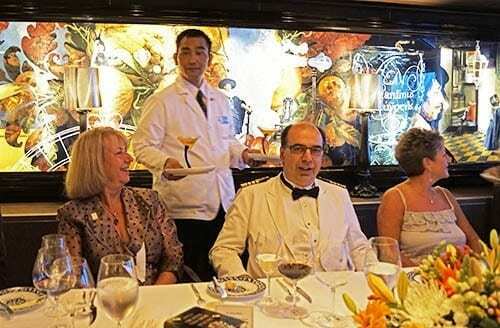 On our first week during this sailing, we experienced a wonderful meal at The Pinnacle Grill. So during our last few days of this cruise, we are giving all three a second go-round. First up is the Canaletto charging an extra $10 per person. A restaurant with a creative menu and enjoyable food, the Canaletto unfortunately suffers from a poor location. Simply sectioning off a corner of the Lido, without providing better separation and the least bit of atmosphere, does not do justice to Chef Naik Bhupesh’s inspired Italian menu. On our 6 PM sitting the curtains in the room failed to block the sun from shining into the eyes of several patrons. And our seating next to a room resounding with the clanging of dishes and pans had all of the ambiance of a factory cafeteria. A woman at the table next to us complained further that our dinner had lasted two hours before we finally ordered dessert. Perhaps in a room with a more pleasant ambiance, such as one that resembled an actual Italian restaurant – the addition of some red checked tablecloths possibly – we wouldn’t have minded that the food was extremely slowly served. That being said, savoring each finely crafted dish by Chef Bhupesh greatly diminished the discomfort. 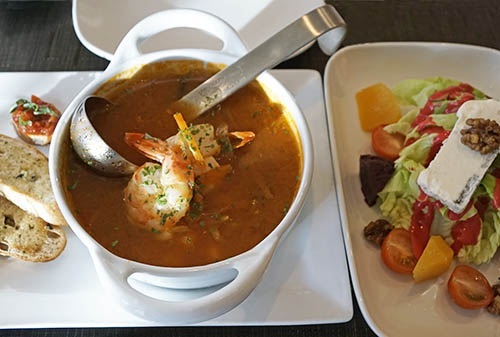 In keeping with the Eurodam’s emphasis on food freshly prepared with fresh ingredients the choices and those of the table adjoining ours were predominately winners. 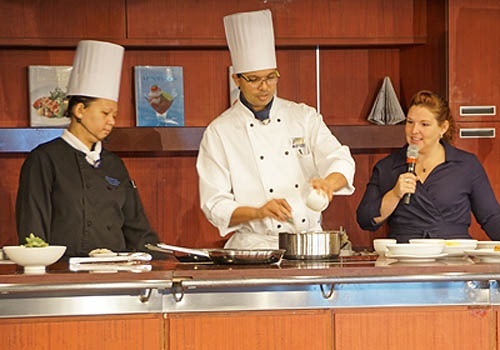 Chef Ming of Tamarind and Chef Bhupesh of Cattalano specialty restaurants in a Culinary Arts Center demonstration. Diners have a choice of ordering their three courses individually or Italian family style. “Spartire,” or sharing, in the latter works this way. Every two diners order two small plates, one pasta dish, and one large plate to share. Jialin and I couldn’t decide on the two small plates, so out waiter suggested we go for three, Zuppa di Pesce, a tomato saffron broth filled with a variety of tender seafoods; a Canaletto Salad of lettuce with beets, candied walnuts, and Gorgonzola with a raspberry vinaigrette dressing; and Eggplant Caponata containing golden raisins, pine nuts, and mint. Our heartily satisfying (i.e., more than enough) pasta choice of Pappardelle consisted of large pappardelle noodles in a savory lemon-herb emulsion sauce, artichokes, and both prawns and large shrimp. One of the men at the table next to us raved about the braised short rib of beef in his Potato Gnocchi. He swore it was the best he had ever tasted. Finally, the large plate for us was the least satisfying. Our Grilled lemon-thyme White Sea Bass was only ordinary. The Sauteed Veal Picata at the other table, however, looked amazing. Our desserts of Tiramisu, heavily saturated with rum, and Limoncello Crème were terrific and Jialin and I both felt were superior to any we have seen in either the Lido or Rembrandt restaurants. Cocktails and a selection of 17 wines, available by the glass, carafe or bottle, complete the meal. My verdict on the Canaletto? This new menu that was begun this year is superior to the very nice, but typical, Italian meal that we enjoyed four years ago. The quality of the food, however, is a mismatch with the space. The chef deserves a better venue. Have you ever seen a chocolate fortune cookie? More specifically, a chocolate almond cookie the size of a woman’s size 6 shoe? That’s just one of the adventures in Asian cuisine on the newly revised menu at the Tamarind restaurant. Wok seared lobster with ginger and garlic entree at Tamarind Restaurant on the Eurodam. Our meal at the Tamarind on our previous sailing was a lunch. So I can’t fairly compare that meal, which I recall was quite satisfying, with this dinner. Coincidentally our choice for lunch today in the Lido was Asian as the Flavors of the World offering. It was typically average Asian restaurant fare and I am naturally expecting much more from the Tamarind that touts “food evoking the rich culinary traditions of Southeast Asia, China and Japan,” is located in a space with an understated Asian décor but a commanding view on the ship’s observation deck, and charges an extra $19 per person. This is just the second cruise after recent additions were made to the Tamarind menu that already comprised a veritable festival of Asian flavors for the curious diner to sample. 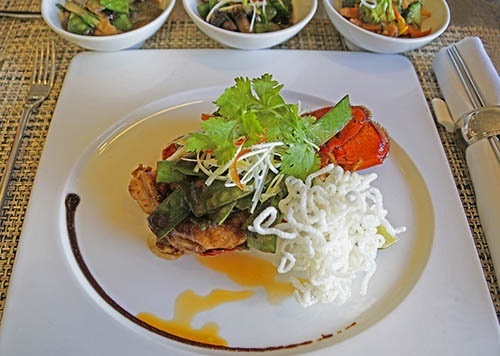 Everything on the menu is cooked to order and the helpful, charming Asian women serving in the restaurant take care to accommodate any dietary restrictions and adjustments for taste such as spiciness and saltiness. Soups and appetizers are followed by the choice of either a sushi and sashimi menu or a menu organized around the five Chinese elements of water, wood, fire, earth, and metal (the cooking tools used to prepare the first four). 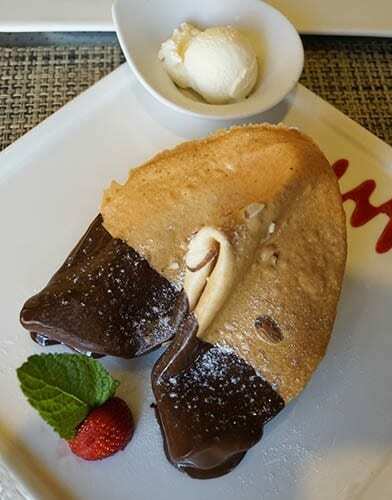 Tamarind Restaurant’s unique chocolate fortune cookie. Our soup starters of vegetarian Indonesian-style Laksa and Jewels of the Sea, shrimp-filled dumplings in a lemon grass and sesame broth, were disappointing and delicious, respectively. Appetizers that we shared followed. The first, a satay sampler of meats and shrimp with two traditional dipping sauces covered a swath of cuisine tastes from Malaysia, China, Thailand, Indonesia, and Vietnam. Next came a Shrimp Tempura Indochine served with a highly tasty tart-and-sweet green papaya salad. Finally, having much experience with Peking Duck in some of China’s best specialty duck restaurants, we ordered up the Tamarind’s version, although we should not have bothered. Best that they leave this dish to the specialists. For the main course we chose to go with the five Chinese elements menu. The decision was made to select a couple of the dishes newly added as opposed to two retained from the previous menu that are the most popular, Wasabi and Soy Crusted Beef Tenderloin from the Wood choices and Penang Red Curry Coconut Chicken from the Fire list. My quite generous portion of Wok Seared Lobster with Ginger and Garlic from the Water selections was a no-brainer that made a big splash with me (don’t groan, it really did). On the other hand, Jialin decided to go the adventurous route by choosing a familiar Chinese “delicacy” that few would assume to be exemplary of China’s cuisine, Taiwanese Braised Pork Belly (although ironically for a dish labeled Taiwanese, it was just like Chairman Mao’s favorite pork dish as found in Hunan). Think chunks of unsliced bacon that are five alternating layers of lean and gelatinous fatty pork. My encounters with this dish in China were always decidedly inedible, however, this version was melt-in-the mouth sweetness. Although I found that cutting out that fatty layer and going with just the lean made it more palatable psychologically. Eurodam Captain Werner Timmers entertaining guests in The Pinnacle Grill. 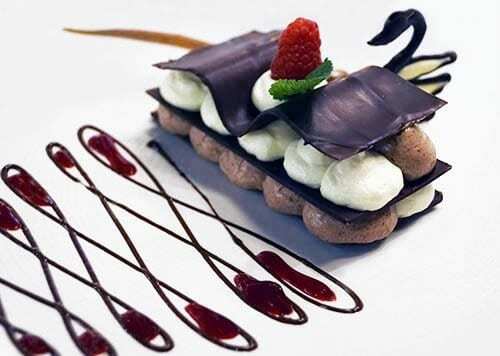 The Pinnacle Grill pastry chef’s special ultimate chocolate dessert. The atmosphere in the Pinnacle is refined, but relaxing. The backlit wall panels of montages of Dutch master painters and their most famous works cast a warm glow of multi-colors throughout the otherwise dimly lit room. Service as before was impeccable. And to be brief, the fillet mignon served this time with lobster tail was even better, if that is possible. But what topped the meal off this time was a surprise creation by the pastry chef, “The Ultimate Finale Duo of White and Dark Chocolate.” Perhaps the chef has a tendency to exaggerate the titles of his desserts, but I left convinced this one was not hyperbole.